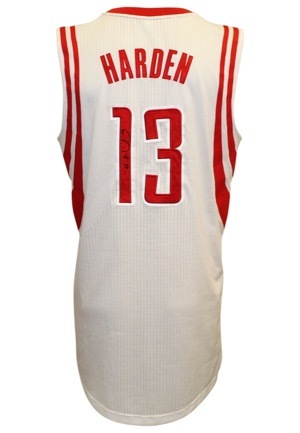 This jersey was worn by Houston Rockets superstar James Harden on both December 31, 2014 and January 3, 2015. In the first victory on December 31 against the Charlotte Hornets, Harden nearly recorded a triple-double, scoring 36 points, adding 7 rebounds and 6 assists. In the January 3rd route of the Miami Heat Harden poured in 28 points and grabbed 5 rebounds. 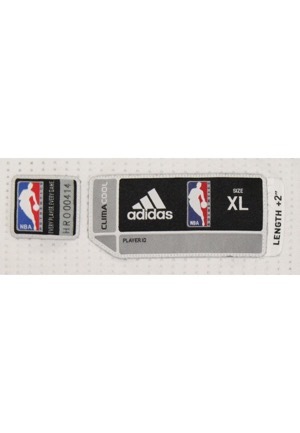 On the front left tail is the Adidas “CLIMACOOL” manufacturer’s tag size “XL”. Attached is a “+2 LENGTH” flag tag. Adjacent is a NBA Authentics tag serial code “HRO00414”. On the left inseam is a flag tag with jersey materials and washing instructions and an additional Adidas flag tag. Attached to the collar is a flag tag reading “MADE IN THAILAND XL2”. On the upper left chest is the official “NBA” logo embroidered. Across the chest reads “ROCKETS” in red on black tackle twill. Adjacent below and on the back is the player number “13” in red mesh on red on white tackle twill. 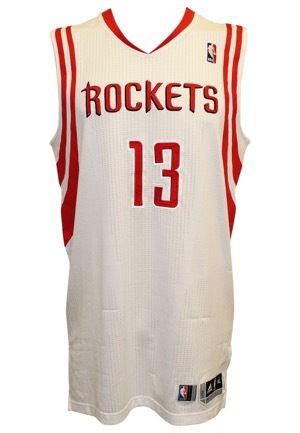 Across the back reads the player name “HARDEN” in red tackle twill sewn directly into the white mesh jersey. 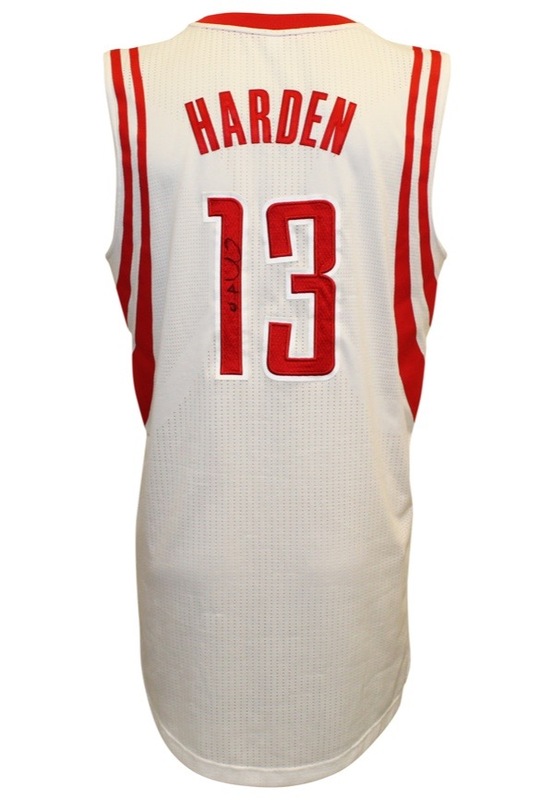 Harden signed on the back of the jersey inside the player number “1” in black marker and in our opinion the signature rates a near 8. This jersey is properly tagged, was presented to us as game-used and in our opinion shows excellent Use. Accompanied by a LOA from JSA, a Photo-Match.com LOA grading the jersey a perfect 10 and LOA’s from Photo-Match.com and RGU confirming the match.